membership drive, and a year-end appeal. building greater racial and ethnic diversity within the organization’s donor base. We recognize that donors and funders have particular influence within organizations. We seek to diversify the voices who carry that particular influence and create a child advocacy community where our donors are advocates and our advocates are donors. Our Vision is that all of Washington’s children will have what they need to grow up to be the people they dream of becoming. Every child regardless of race, culture or economic status, has a right to protection, nurture, encouragement, support and opportunity. It is not a matter of charity but rather of justice. As adults, we are individually and collectively responsible for the well-being of children. Early Investment Pays the Highest Dividends! What we do today, or fail to do, has long term implications. We need to act now to assure a better future for our children. Historic and systemic racism damages the well-being of kids and families in communities of color—and compromises the shared future of all Washingtonians. Fighting racism in state and federal laws, budgets and program decisions depends on an anti-racist approach to our internal operations, too. We have a right and responsibility to make our government responsive to children by advocating for equitable treatment and opportunity for people from all backgrounds, abilities and needs. 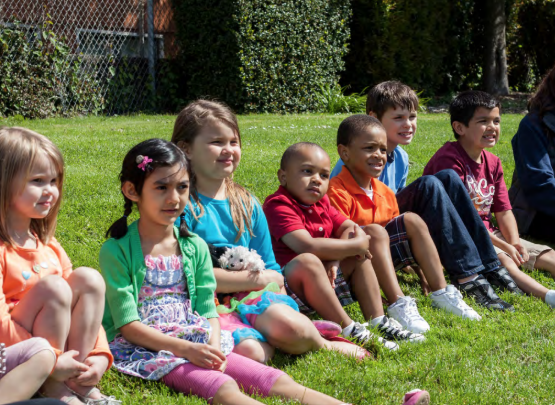 Over more than three decades, Children’s Alliance has been improving the lives of Washington’s kids by effecting positive changes in public policies, priorities, and programs. You can count on the Children’s Alliance to ask the critical question: “Is it good for kids?” And to fight hard to make sure the answer is “Yes!” for Washington’s 1.6 million kids. Ensuring that all our efforts address disparities facing children and families in communities of color. In all of our work, we center racial and ethnic equity. Our approach creates results that change kids’ lives. We have a long history of setting and reaching ambitious goals. We speak directly to decision makers and participate in the policymaking process. We collaborate with like-minded organizations and leaders. We listen and learn from our allies, members, funders, and donors, and to the children and families who are directly affected by the policies on which we work. Children’s Alliance mobilizes thousands of individuals and organizations to make policy work for kids by taking action, speaking up, and giving donations that make change possible. We are powered by our many partners — representing a diverse array of programs, services, and communities seeking to improve the lives of all children in our state. Nearly 70 organizational partners from across the state join with us and invest their time and resources to improve policies for Washington’s children. Over 9,000 individuals stand with us as part of our stand with us as part of our online action network. Our network extends to every corner of the state. when all kids get the childhoods they deserve. For more information about Children’s Alliance, visit our website at childrensalliance.org. The Donor Relations Director will provide strategic leadership and management of Children’s Alliance’s efforts to grow partnerships, ambassadors, and financial supporters by developing, managing, and implementing a successful and inclusive fund development plan, including oversight and implementation of an annual “Voices for Children” luncheon, a leadership donor campaign, an organizational membership drive, and a year-end appeal. They will do this work in the context of an anti-racist framework that promotes greater racial and ethnic diversity in the donor base, and ensures that our donors are our advocates, and our advocates are our donors. This position works directly with and reports to the Executive Director, leads and manages one direct report, and supports an enthusiastic staff and Board of Directors in their fundraising efforts. The organization has an annual budget of $1.6m, the majority of which comes from foundation grants. The Donor Relations Director will be asked to manage and grow the individual donations (currently $300,000 annually) that give the organization the flexibility it needs to nimbly respond to policy challenges. implementing donor cultivation plans that provide value to donors and create connection points with additional staff and board members. • Directly solicit support from individual, foundation, and corporate donors, and collaborate with the Executive Director to personally solicit major gifts. • Serve as an effective spokesperson, storyteller, and relationship-builder for the Children’s Alliance, effectively and comfortably representing the organization to prospective and current donors, community partners, and other external audiences. • Directly supervise and support the Donor Relations and Data Manager, working in partnership to efficiently develop and implement the key fundraising programs. • Work in partnership with the senior leadership team and others to assist with grant prospecting. organizational marketing and communications efforts. • Lead and model a healthy and collaborative culture of philanthropy within the organization, emphasizing the role of fund development in supporting the organization’s racial and ethnic equity and anti-racism efforts. particularly those that are relevant to advocacy organizations and reflect the integration of anti-racism principles. • Provide support to the Board of Directors, the Board Ambassador Committee, and other volunteer fundraising and cultivation efforts, ensuring successful follow-through on key strategies. • Establish, track, and evaluate key metrics for all fundraising programs, using meaningful data to continually improve practices and inform future revenue goals. We seek a leader with a commitment to Washington’s kids and families and an eagerness to raise money on their behalf. We recognize there are many paths to readiness for this position. We seek candidates who have self-awareness about which of the qualifications described below they will need to develop further to be successful, and are willing to dive into learning as needed. experience fighting racism in previous work or personal experiences. We seek someone with a strong orientation to systems change as a strategy for securing social and racial justice, and someone who brings both resolve and humility to the work. Experience working in racial and ethnically diverse environments is highly valued. We seek candidates who have successfully managed broad and inclusive giving programs, and secured a range of donations through face-to-face solicitation, including major gifts. We seek someone who can create innovative donor engagement and cultivation strategies, utilizing data to track outcomes, that result in increased unrestricted contributed revenue. Experience managing staff and a fundraising budget is desired. Past experience working in an issues-based or advocacy-focused organization is highly valued, as is past experience growing a program or campaign. a team and values-orientation, bringing leadership and inspiration to fund development. Past experience working with a board of directors and volunteers is highly desired. We seek candidates with excellent written and oral communication skills, including the ability to write persuasively in clear and concise language, and the ability to speak with enthusiasm to diverse audiences. Proficiency in Microsoft Office and relational/client management system databases (Salesforce preferred) is desired. bring their full and best selves to their work. We are committed as a team to shared learning and work on undoing institutional racism. We dedicate time in supervisory, team, staff, and board meetings to better understand how racism shows up in the public policies and child-serving systems we seek to change – and in our own internal policies and practices. This work is challenging. It calls for each of us to be vulnerable and to take risk. We handle the challenges that arise with care and compassion and learn from them together. For us, this work is central to our mission. This is a full-time exempt position reporting to the Executive Director. The salary range is $60,000 to $65,000. The Donor Relations Director will be based in the Children’s Alliance Seattle office, which is located in the International District/Chinatown. This position requires some work in the evenings or on weekends for meetings or events. Children’s Alliance encourages its staff to maintain a healthy work-life balance. To that end, the organization offers a flexible work environment and 12 days of paid vacation in the first year (with incremental increases each year of employment) as well as 13 days of paid holidays, including 3 floating holidays. This position also offers sick leave and paid family and medical leave, as well as employee and dependent health and dental coverage. Children’s Alliance recognizes and honors diversity in race, ethnicity, culture, age, abilities, gender, sexual orientation, and places where people live. We seek to reflect this diversity in all aspects of our work, including the composition of our membership, board, and committees, staff and volunteers. Further, the Children’s Alliance seeks to be a multicultural and culturally competent organization that works for equity among all people. We have a racial equity theory of change adopted by the Board of Directors and utilized throughout our work. We strongly encourage applications from people of color, immigrants, refugees, women, people with disabilities, members of the LGBTQ community and other underrepresented and historically marginalized groups. Online applications only, please no email or paper submissions. You will be asked to upload a resume and a cover letter, and invited to complete the optional EEOC form. In your cover letter, please describe as specifically as you can why you are interested in joining the Children’s Alliance team, and how your skills and experience are a fit with the goals of this position and the mission and values of this community. Applications received by 5:00PM on March 8, 2019 will be given full consideration. All applications will be acknowledged via an email receipt. Consideration will be given to applications as soon as they are received; we encourage early applications. Interviewing will take place in March. Next articleFebruary 5, 2019 — Arts Etc.